Birria at La Terraza, a Mexican restaurant in Detroit’s Springwells neighborhood. 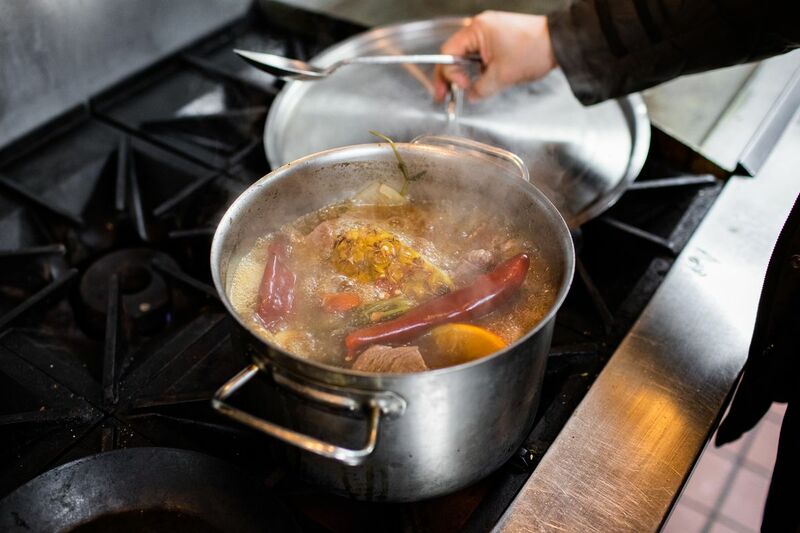 It’s a frigid winter afternoon in Detroit, and Eddie Vargas is bent over a stockpot as he prepares to make birria, a fiery, crimson meat stew that’s steeped in family tradition. He tosses dried guajillo, pasilla, and ancho chiles, along with the skin of a pineapple, onions, cilantro, and tomato — plus his family’s special ingredient, ginger — into the cauldron with a pile of beef chuck roast to simmer for a couple of hours. He transfers the meat into the oven, with a bit of that consomme, to roast for about 30 minutes. Then, it goes back to the broth to simmer a bit longer. By now, the kitchen is filled with an intoxicating aroma thanks to the smokiness of the guajillo chiles, leaving bystanders’ mouths watering. Once the juices have had a chance to soak through the meat, Vargas scoops out a ladleful. The meat is so tender, it easily falls apart at the touch of a fork, or in this case, inside a warmed corn tortilla. Without fail, the first bite transports Vargas to the days when his father showcased his famous birria at quinceañeras, weddings, or family reunions. 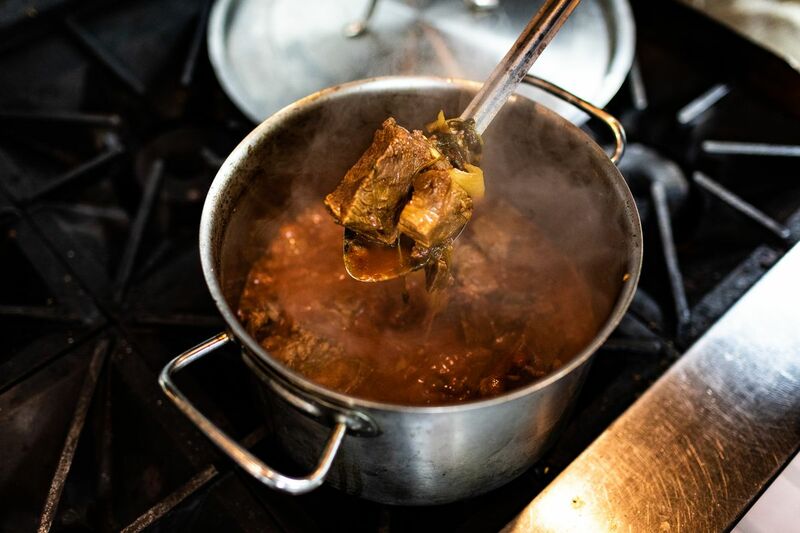 Peso is among a growing number of Mexican restaurants in Detroit that offer birria, which comes primarily from the western Mexican state of Jalisco. A large and growing Mexican community in Detroit also has roots in the region. Thirty-plus years prior, Detroit’s longtime Mexican restaurants shared nearly identical menus with more of a Mexican-American flair. Today, travel down Vernor Highway, on Detroit’s southwest side, where a majority of the city’s Latinx community lives, and the jalisciense presence can be seen everywhere from regional taco trucks and sit-down restaurants like Los Altos, Taqueria El Nacimiento, and Taqueria Mi Pueblo, to tire shops, butcher stores, and even a Detroit-based tequila brand. While birria isn’t quite a mainstay in most of the longtime Mexican establishments in Detroit, more known for cheesy enchiladas, flautas, or the uniquely Detroit nacho-like dish botana, that’s beginning to change. 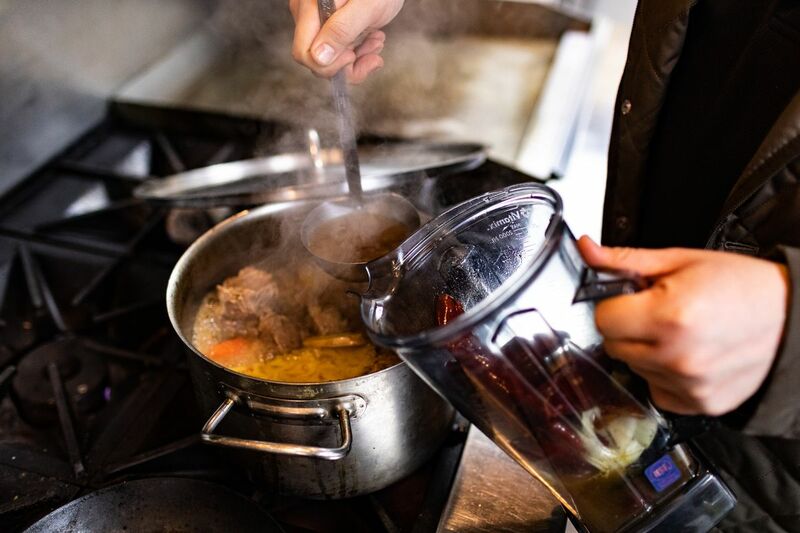 Eddie Vargas prepares his father’s recipe for birria in the kitchen at Peso, a soon-to-open restaurant and bar in Detroit’s Hubbard-Richard neighborhood. For the uninitiated, birria is a stew prepared with meat traditionally roasted in a pit. Today, it’s cooked in an oven or large pot — in much the same fashion that Vargas does it. 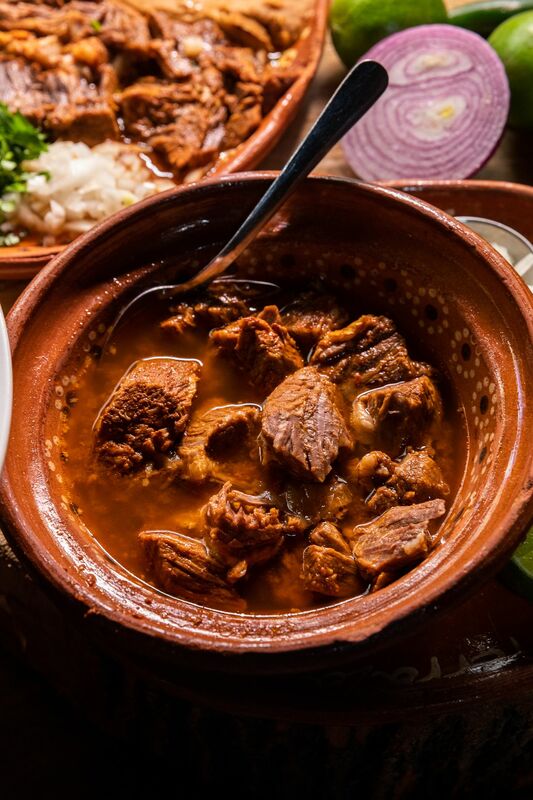 Birria can be made with any protein, including lamb, rabbit, goat, or beef. In Jalisco, goat is the most typical, though beef is also used. Often, the meat is dry rubbed in a blend of chiles and then stewed in a broth-like combination of fruit (such as parts of a pineapple or orange) and the drippings from the meat. The result is flavor that seeps deep into the melting, tender meat. It’s generally a celebratory dish, served at weddings or other special occasions. 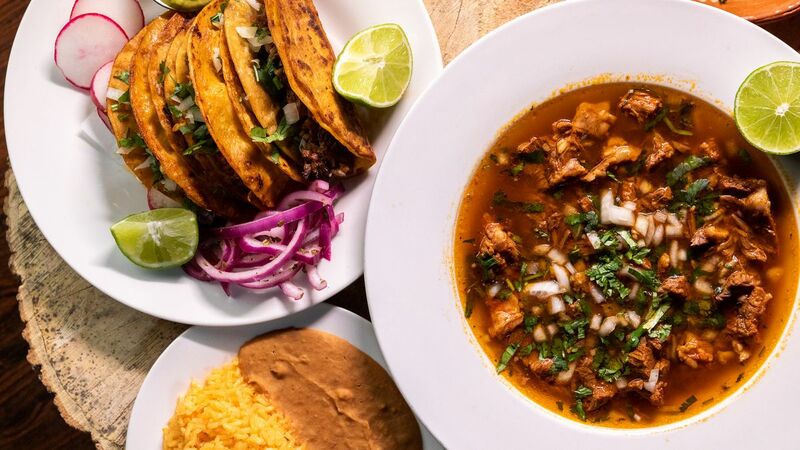 Often birria is presented with meat on a plate and the juices served on the side as a filling for tacos or quesadillas, or, as is the case of several Detroit eateries, as a soup with an accompaniment of diced onions, cilantro, and a squeeze of lime juice. 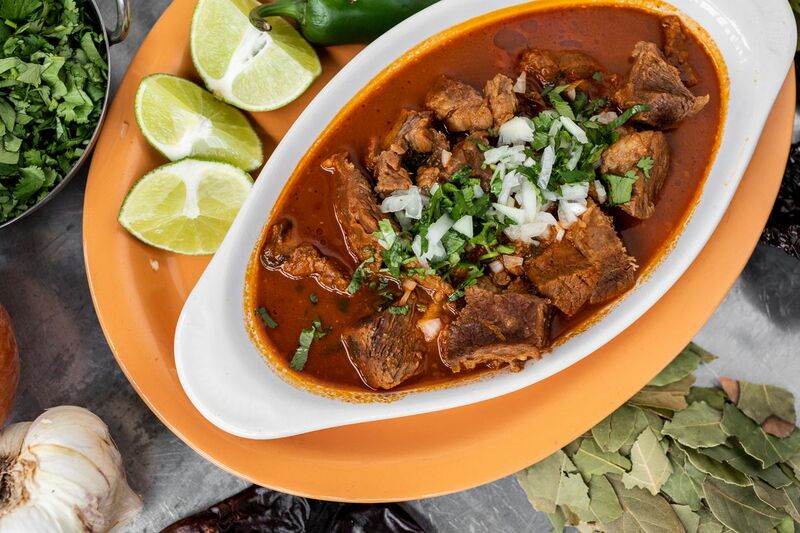 Birria recipes differ from state to state, even from one town to the next. Vargas, who was born in Arandas in the highlands of Jalisco and raised in early childhood in San Ignacio (about 20 minutes away), says his family makes heavier use of guajillo chiles for a smokier flavor profile, and simmers the chiles, the other ingredients, and the meat with water instead of doing a dry rub. This creates a better stock, he says. In Detroit, Mexican restaurants like Peso usually use beef, to account for Midwesterners’ preference for cow, and tend to only offer the dish as a weekend specialty. Birria’s entry into Detroit speaks to a generations-long connection between the Motor City and the highlands of Jalisco. Immigrants from Jalisco started making their way to Detroit in smaller numbers around the 1940s. Some families arrived as part of the Bracero Program, a World War II-era policy that admitted Mexican workers into the United States to address a wartime labor shortage on a temporary basis. In Michigan, many of these laborers built out the railroads or worked for the automotive industry. More recently, jaliscienses came in larger numbers in the 1970s and ’80s, with the largest influx relocating to Detroit in the 1990s, says Maria Elena Rodriguez, a historian of the city’s Mexican community. Vargas removes liquid, chilis, and onion from the pot and blends them. The mixture is then added back to the sauce. Vargas removes the meat from the pot and slices it into smaller bites before plating it. Rodriguez’s father owned several meat markets in the 1950s. According to him, Rodriguez says, birria really didn’t have a presence in local restaurants back then. In fact, the only birria maker her dad knew of in Detroit came to the city in the 1970s, when he played on an amateur soccer team with people mostly from Jalisco. One of his teammates was a man by the name of Beto Angel, originally from Jesus Maria, who sold birria to his friends from a house at Fort and Campbell in the Delray neighborhood below the I-75 freeway. “To this day, my dad will say, ‘I want some birria, but I want it from Beto,’” Rodriguez says. Angel went on to open a restaurant called Las Brisas located in Springwells. The restaurant later changed hands and the property was eventually sold to Israel Rocha, owner of La Terraza. To this day, though, Angel’s birria continues to be the stuff of local legend, Rodriguez says. Rocha’s La Terraza also sells birria, but that didn’t happen until he was already in business for several years. He moved to the Motor City, joining some of his relatives, in the early ’80s. He first worked as a bricklayer, but about 13 years ago he opened La Terraza — Spanish for “terrace” — in a small space on Lawndale Street. His first iteration of the restaurant focused primarily in mariscos (seafood). For the first time, Detroiters of all walks could experience a seafood-centric menu of cocteles de camarón (shrimp cocktails), ceviche (a dish made up of a mix of citrus-cured fish), and caldo de siete mares (seven seas soup, a hearty stew loaded with a variety of shellfish, shrimp, octopus, and other seafood). Birria tacos at La Terraza. Birria is made with beef at La Terraza. When La Terraza opened, Detroit had just begun to catch on to traditional taquerias, such as Taqueria Lupita’s and Taqueria Mi Pueblo, both of which specialized in serving tacos made with cuts of meat like lengua (beef tongue) and suadero de res (a smooth cut of fried beef), as well as Mexican food trucks. To Rocha, adding Mexican seafood to the mix was long overdue, and customers seemed to agree. “It reminds people a little bit of home,” says Rocha. The birria came after Rocha relocated to the former Las Brisas space. There, he could have a full bar and room enough to host live music performances. And, of course, he could create a more expansive menu that would include other regional favorites from his hometown in Jalisco. That included dishes like birria, which at La Terraza is available as a soup, a dinner platter, or in tacos dorados. Like Vargas’s version at Peso, La Terraza’s recipe uses beef instead of goat. “The goat has a very strong flavor, so we use beef,” Rocha says. 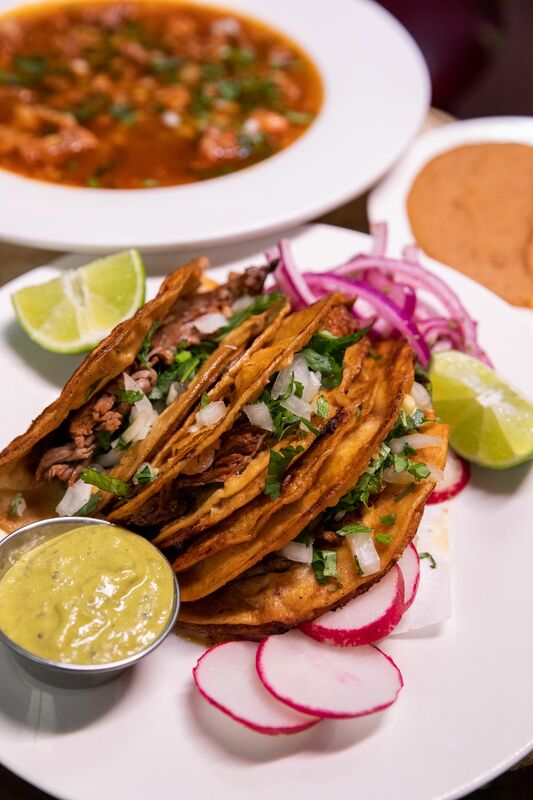 Currently, birria is also available at a handful of other eateries, including Tacos El Primo (known for its birria quesadillas) and El Caporal, both as soups. There’s also a handful of off-the-books informal restaurants that carry birria with goat. Peso will be the latest to enter the birria game. Vargas, 34, was born in Arandas in Jalisco, but his family moved to Southern California when he was four years old. They eventually relocated to Detroit in the late ’90s, and with them came his father’s recipe. About four years ago, craving his favorite dish, Vargas asked his father to teach him how to make it. With time, the younger Vargas’s rendition rivaled his dad’s. “I challenged him one day to see if mine was close to his, [and] he actually said it was pretty close,” he says. Birria is topped with fresh cilantro, chopped onion, and a slice of lime at Peso in Detroit. Vargas has taken point on the menu at Peso, where he plans to present his beloved family recipe. He’s partnered in the project with his longtime friends Carlos Diaz de Leon, Jose Maldonado, Corey McIntosh, and Cabresto Tequila owner Tony Lopez. The bar and restaurant is a reflection of the group’s Detroit upbringing, with a hip cantina aesthetic that emphasizes fancy margaritas and palomas. It’s partly an homage to Jalisco, where most of the partners hail from, though the menu will draw from other regional Mexican cuisines. Following the opening of Peso, the partners are also working on a similar, though more upscale restaurant, Toma (Spanish for “drink up”), in Detroit’s nearby Corktown neighborhood. Again, the stewed meat will be on display, this time as the filling for Venezuelan-style arepas, proving that Vargas can continue to evolve his family’s birria recipe into a new direction. Serena Daniels is a freelance writer and editor of Tostada Magazine. Edited by Eater Detroit editor Brenna Houck and Eater city editor Missy Frederick with copy editing by Emma Alpern.